For all those lovers of two tone "bling" take a look at this beauty. 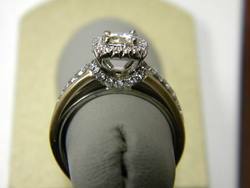 This very fun and knowledgeable lady looked in our case and found this beautiful setting, but asked about a halo to surround her center stone. Not a problem because most settings are designed to allow for the center to be interchanged, adapting to shapes and sizes of diamonds. So a simple change of prongs for a single diamond to one surrounded by smaller stones, gives this setting a whole new look. 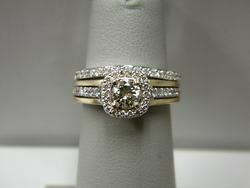 Add a simple white gold diamond band and a stunning original set in born! You can individualize what you see in the case to make it your very own.